The Hall for Ancestral Worship is converted into the Clock Gallery. Selected European and American mechanical clocks collected by the Qing dynasty imperial family, and those manufactured in Guangzhou, Suzhou and the Imperial Workshop are exhibited here. 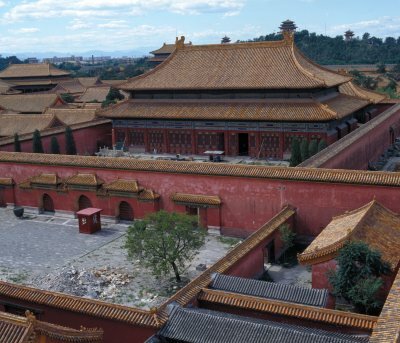 Constructed in early fifteenth century and renovated for several times in the succeeding Qing dynasty, the hall is located to the east of the Three Palaces of the Inner Court. It has two sections situated in an H-shape, a front hall and a rear hall, joined by a covered connecting corridor. The imperial ancestors' spirit tablets were placed here. Each year on the first day of the lunar year, on the emperor's birthday, and on the winter solstice, the emperor would pay tribute to his ancestors in this hall. If the emperor could not attend personally, then he would send representatives.